There will be plenty of promotion connotations on the line when MK Dons travel to Forest Green Rovers on Saturday. Mark Cooper’s side sit sixth in League 2 with seven games to go, while Dons are in the final automatic promotion spot in third. Dons head to Gloucestershire with just one defeat to their name in eight games, while Rovers appear to have found their feet again after a recent wobble, now three unbeaten. Paul Tisdale said: They play a very good brand of football, they're one of the standouts in the league, and have improved a lot on last season. They have signed good players who have kept the team improving. They will be a real challenge to anyone in that top seven or eight. I've watched them play a few times. They're a good team." 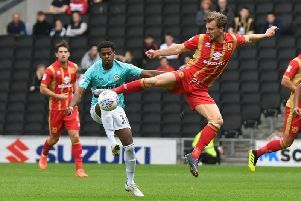 Dons’ only previous visit to The New Lawn in August 2017 saw them edge past Rovers in the League Cup, with Gboly Ariyibi’s extra time goal the difference between the sides, while they shared a 1-1 draw at Stadium MK earlier this season. "When you get to this stage, Forest Green too are rightly thinking they can get automatic," said Robbie Simpson. "They will be fighting just as much as we are. We have to do everything we can to execute what Tis wants us to do and well enough to win the game. "They will want to run as much as we do, battle and kick every ball. If I'm on the bench, I'll want to kick and head every ball, and their bench will be doing the same. If we're winning, their manager will want to do something and if they're winning Tis will want to do something." >> There will be a minute's applause for former Forest Green chairman Trevor Horsley before kick off.